In my home business we have weekly training calls that address powerful personal development topics that have dramatically assisted me in creating amazing results in many areas in my life. 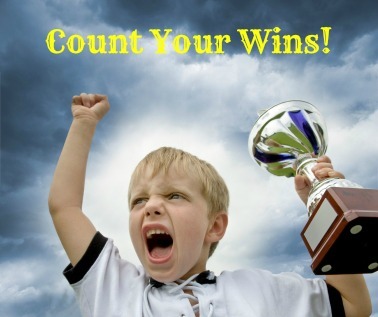 A couple of weeks ago we addressed a powerful exercise that is called “counting your wins”. The principle is quite basic – list 10 wins that you experience everyday that are bringing you closer to your goals. I initially thought that this would be very easy. Boy was I ever wrong! I found myself struggling for the first couple of days piecing together even 7 wins! It does get easier as you go. Now I find myself counting my wins throughout the day to add to my list at the end of the day. I think another point worth noting is setting yourself up with an accountability partner. This means finding a partner who is also interested in moving themselves forward in life and would like to count their wins daily as well. Just like with anything, have someone to keep you accountable, with keep you on track in being consistent. I think this exercise is extremely powerful and really important to implement especially this time of year. Many of us have started the new year with powerful goals and resolutions. Perhaps this exercise will assist you in keeping on track with your progress. Good luck! To your success!